Except between 1850 and 1856, when the government-owned Colonial Bank of Issue supplied all banknotes, trading banks issued their own notes. This came to an end in 1934 when the Reserve Bank, the sole supplier of banknotes, was established. 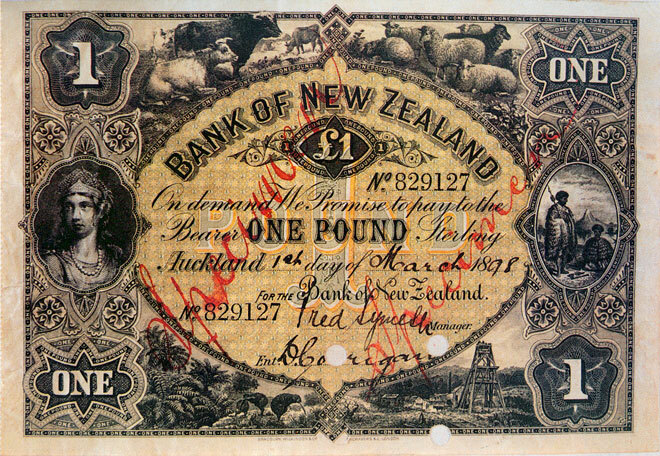 This ornate £1 note was issued by the Bank of New Zealand in 1898. It features pastoral scenes and a mine, representing industry. The two Māori figures, kiwi and native bush symbolise New Zealand. The reverse features an idealised scene of kiwi before a Māori kāinga (village) on a lake shore. The designer did not let the fact that kiwi are shy nocturnal birds interfere with the creation of an idyllic New Zealand scene.